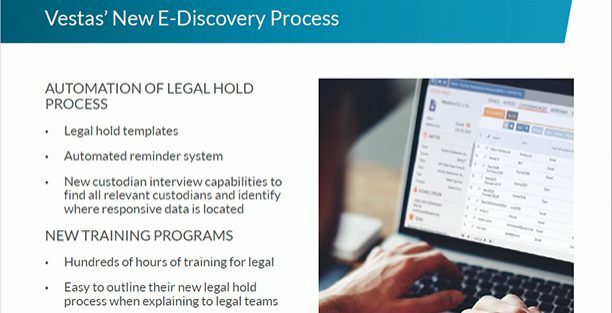 In this on-demand webcast, Vestas discussed their e-discovery process, how it’s managed, who’s involved and how they streamlined e-discovery activities. In this on-demand webcast, Vestas Wind Systems' Sr. Litigation Paralegal, Beth King, who manages Vestas' preservation process, discussed how they were able to improve and streamline their e-discovery and pre-litigation processes.